Using flipcharts, community health worker Marofa Sohila educates women on family planning issues. In the village of Kakara, in the Qarabagh District of Afghanistan, a community health worker is welcomed into a house, where she will provide lifesaving educational messages for a mother and her eight-day-old baby. Seven years ago, health services in this area were virtually non-existent and maternal and newborn deaths were commonplace. Today in Kakara, Marofa Sohila is working to improve the health of women and babies in her community—one family at a time. During this visit to Pari’s home, Marofa continues the education she began while visiting the mother before she gave birth—with no complications—at the district hospital. The goal is to persuade the 37-year-old Pari to do what she hasn’t done before—plan her next pregnancy. In Afghanistan, expanding access to and use of contraceptives is imperative to saving mothers’s lives. After 23 years of conflict, the country’s health system had been nearly destroyed and health indicators for women and children were abysmal. Today, one Afghan woman dies every 30 minutes from pregnancy-related causes, such as bleeding, obstructed labor or infection; however, 78 percent of these deaths are largely preventable. There are proven approaches to reducing maternal deaths, including increasing access to family planning with related reproductive health services, skilled attendance during pregnancy and childbirth, emergency obstetric care and immediate post-delivery care. Women and their children are the primary beneficiaries. The Jhpiego-led Health Services Support Project, which is funded by the U.S. Agency for International Development, is working with the Ministry of Public Health in Afghanistan and the Management Sciences for Health-led Tech Serve Project to revitalize and expand community-based postpartum family planning services. At the outset, the ACCESS-FP program provided technical assistance to develop national training and educational materials. Through this program, 8,500 community health workers in 13 provinces have received the training and materials needed to bring this vital information to women in remote villages. Only 16 percent of Afghan women between the ages of 15 and 49 use modern methods of contraception, and a woman will give birth to an average of seven children. In Kakara, the newest addition to Pari’s family, daughter Safo, is her fourth child. Pari’s other three children are ages seven, four and three. Active and respected in the community, Marofa, the community health worker, is warmly greeted on her second visit to Pari’s home since the new baby arrived. 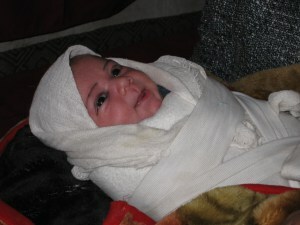 In some areas of Afghanistan, the culturally accepted practice of purdah would prevent Pari from leaving the house for 40 days after birth. That’s why home visits are so important; they provide a vital link between the health facility and the mother. Pari listens attentively as Marofa begins the counseling session by displaying a flipchart with pictorial messages. 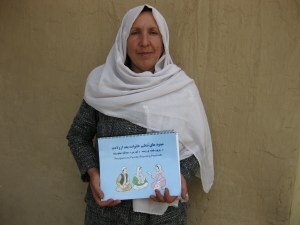 Many villagers in Afghanistan, like Pari, are non-literate, and the flipchart illustrations convey the critical messages that should improve health outcomes for Pari and her baby girl. Pari’s mother-in-law and sister-in-law sit beside her, studying the pictures as Marofa points to them and explains the importance of timing and spacing of births for the health of the mother and children. The mother-in-law silently nods her head when Marofa reminds the women that the Koran says that babies should be exclusively breastfed and children should be spaced two years apart. The mother-in-law is influential within the household; ultimately, her support will determine whether Pari will move ahead with another method for birth spacing after she is no longer eligible for LAM. The community health worker is careful to include the mother-in-law and Pari’s other support persons in the counseling sessions so that the female members of the household are informed about the health benefits of birth spacing. Over the next six months, Marofa will make several other visits to the home to continue counseling and provide Pari with family planning options, if she chooses. The community health worker’s visits aren’t for mother alone. Children are a blessing to Afghan families and the community. By providing community-based education about the advantages of healthy timing and spacing of births, Marofa is ensuring a healthier future for Pari and her children.